Kailey Bradt, a student in RIT’s Master of Science in product development program in the Kate Gleason College of Engineering, won first place and $10,000 at the New York State Business Plan Competition. 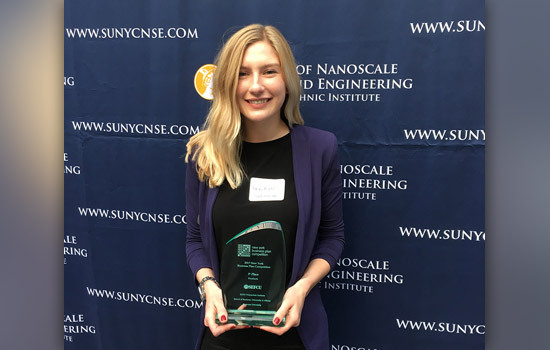 Kailey Bradt, a student in RIT’s Master of Science in product development program from Corning, N.Y., won first place and $10,000 in the “Products” category at the eighth annual New York Business Plan Competition, sponsored by SUNY Polytechnic Institute and the University at Albany. The competition was held in April at SUNY Poly’s Albany NanoTech Complex and featured 103 teams that were selected to compete after making it through regional semifinal rounds that were held across the state. According to Bradt, her entry—OWA Haircare— is a waterless shampoo that saves water, plastic and energy. All ingredients have a safety rating of 1, the safest rating that can be achieved on the Environmental Working Group’s Skin Deep database. The ingredients are naturally derived, not sourced from animals, making the product completely vegan. Follow OWA Haircare on Facebook and Instagram at owahaircare. In addition to Bradt’s win, seven other student teams from Rochester Institute of Technology presented in five categories. Gaia— Brent Chase and Liam Herlihy. Gaia also won an undergraduate Excellence Award in this category. A panel of national venture capitalists, angel investors, and investment bankers selected the winning teams and offered invaluable feedback for each team that took part in the competition. Students from 60 colleges and universities competed in the overall competition, including the following institutions that were represented in the final round of the competition—SUNY Polytechnic Institute (including teams from both its Albany and Utica campuses), Syracuse University, Clarkson University, Binghamton University, RIT, Cornell University, Marist College, Siena College, SUNY Geneseo, University at Buffalo, Hofstra University, University of Rochester, United States Military Academy, Columbia University, Farmingdale State College, Fashion Institute of Technology, New York University, University at Albany, Buffalo State College, Canisius College, CUNY Zahn Innovation Center, Daemen College, Dutchess Community College, Hobart and William Smith Colleges, Long Island University, Medgar Evers College, Mt. St. Vincent, Pratt MWP, Rensselaer Polytechnic Institute, Stony Brook University, SUNY Cobleskill, SUNY New Paltz, SUNY Plattsburgh, Utica College, Wells College, and CUNY Baruch College. Since the competition’s inaugural event in 2010, more than 2,100 student teams from 75 New York state colleges and universities have competed, claiming more than $2,300,000 in cash and in-kind prizes. The competition enables each student-led team to explain their innovation in a set amount of time, with teams competing against others whose products, services, or developed ideas fall within a similar category, or track. More information about the 2017 New York Business Plan Competition can be found at: http://www.nybplan.com.